1）Additional cardholder(s), as well as cardholder(s) with existing RBC Royal Bank travel rewards credit cards, applying for or transferring to an RBC Visa Infinite Avion card as of the offer eligibility period, are not eligible for this offer. 2）Additional cardholders are not eligible for this offer. 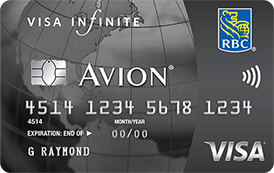 3）Additional cardholder(s), as well as existing RBC Visa Infinite Avion or Visa Platinum Avion, Cathay Pacific‡ Visa Platinum, British Airways‡ Visa Infinite, RBC Rewards Visa Preferred, RBC Avion Visa Infinite Privilege and RBC Avion Visa Infinite Privilege for Private Banking cardholders, applying for or transferring to an RBC Visa Infinite Avion card as of the offer eligibility period, are not eligible for this offer.